Another blast from the past that'll blast your eardrums, is going down at the same time, at The Vic tonight. Some of our favorite L.A. metal heads rock The Vic with 3 openers. 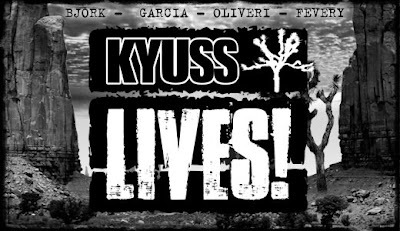 Kyuss Lives! The band is back for chapter 2...the legacy continues, with 3/4 of the original members. 3 outta 4 ain't bad--and they're a pretty key 3. Here's the approximate set times and opening bands. 6:30 Bible of the Devil, 7:20 Black Cobra, 8:10 The Sword, 9:20 Kyuss. Tickets are available at the door or on line through Jam Productions. Still waiting on the verdict on photo/press credentials, but we're hoping to master the art of cloning to be in two places at the same time and bring you some sweet show shots.